The M1 Abrams is an American third-generation main battle tank. It is named after General Creighton Abrams. Highly mobile, designed for modern armored ground warfare, the M1 is well armed and heavily armored. Notable features include the use of a powerful multifuel turbine engine, the adoption of sophisticated composite armor, and separate ammunition storage in a blow-out compartment for crew safety. Weighing nearly 68 short tons (almost 62 metric tons), it is one of the heaviest main battle tanks in service. The M1 Abrams entered U.S. service in 1980, ultimately replacing the M60 tank. The M1 is the main battle tank of the United States Army and Marine Corps, and the armies of Egypt, Kuwait, Saudi Arabia, Australia and Iraq. Three main versions of the M1 Abrams have been deployed, the M1, M1A1, and M1A2, incorporating improved armament, protection, and electronics. These improvements and other upgrades to in-service tanks have allowed this long-serving vehicle to remain in front-line service. In addition, development of the improved M1A3 version was first publicly disclosed in 2009. Extensive improvements have been implemeted to the latest M1A2SEPV3 version. A total of 3,273 M1 Abrams tanks were produced during 1979–85 and first entered U.S. Army service in 1980. Production at the government-owned, GDLS-operated Lima Army Tank Plant in Lima, Ohio, was joined by vehicles built at the Detroit Arsenal Tank Plant in Warren, Michigan from 1982 to 1996. The M1 was armed with the license-built version of the 105 mm Royal Ordnance L7 gun. 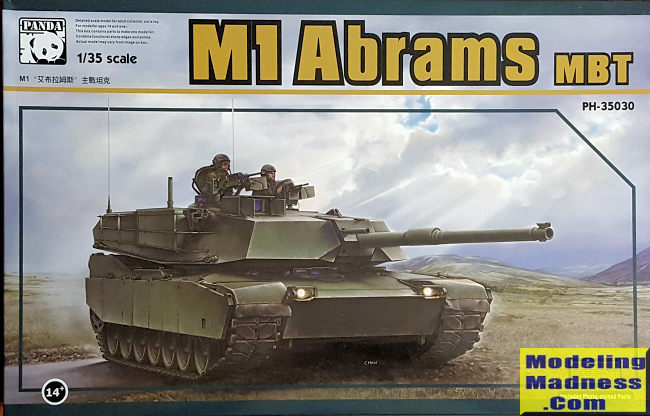 With the introduction of the baseline M1 Abrams, it looks like Panda Hobby will be developing a full line of these vehicles. It was a good move to start with the base vehicle. One of the first things I noticed was there are are four sprues dedicated to road wheels and tracks. Yup, individual track links with this one and the guide pins are separate items as well. The assembly of them looks to be quite prototypical according to a friend of mine who was in tanks during his army days. Road wheels are five parts per wheel and there are eight per side so between those and the tracks, I can see where much of the build time will be spent. The lower hull is a single piece and you attach the suspension pieces to it. Once the wheels and tracks are installed, the upper hull is attached. 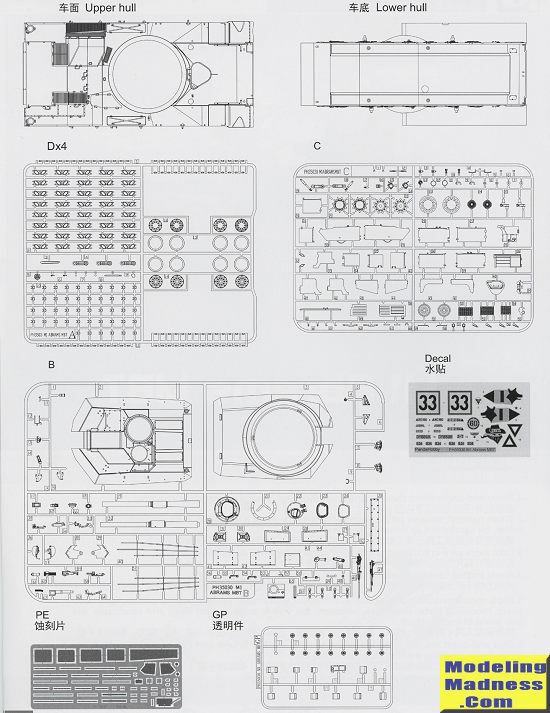 There are some optional bits that go on the kit and as usual, you are given no indication as to w hich markings option they are for. I should mention photo etch as there is a nice fret that includes all the engine grilles, some tow cable hooks for the side of the turret (copper wire is provided for the cables), a few latches, and a plate for either side of the gun attachment area. There is also a curious rectangle with a hole in it. Well, the instructions don't say a peep about this, but it looks like it is a mask to help when painting the tiny rim on the tires that fit on the road wheels. Since this is the initial production M1, there are not the plethora of add-on armor and other bits that eventually became the norm on later modifications. In fact, the most complex bit to add to the turret is the machine gun mount and gun. Actually, you have two guns to choose from, again, with no indication as to which is used with which marking option so your choice. I have no idea what these two are as I thought the M1 used a .50 calibre of some sort, but one of the guns is a lot more complex than the other. Perhaps it just has a more complex mount, but you are given a choice, which is nice. Instructions are well done with the usual dearth of color information. You get a full color painting guide and here you are provided overall colors. It seems that Panda thinks FS 34102 is the proper shade of green for three of the unknown unit options while the fourth adds large areas of sand with smaller areas of white and black to the scheme. 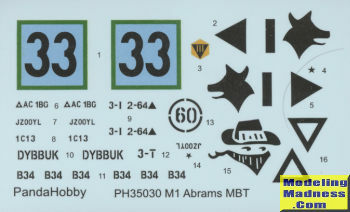 The small decal sheet is nicely printed and provides what few markings these tanks carried. This is a nice addition to a growing selection of armored vehicles and one that I think will get a good response from those who like to do modern armor. It certainly looks like a winner in the box. 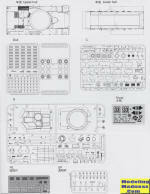 Thanks to Panda Hobby for the preview kit. This should be available at your local retailer.